In 1841 John James Audubon purchased a 14-acre tract of wooded land in upper Manhattan. High above the Hudson River, it was a bucolic Eden of dogwoods, pines, tulip trees and ancient oaks. A waterfall cascaded down the rocks to the river. Ten years after purchasing what became known as Audubon Park, which he deeded to his wife, Lucy, the artist died. His widow lived on, for a while, in the spacious home they had erected. In 1851 her son Victor built another handsome residence on the land, while J. W. Audubon also erected a fine home. In the meantime, just to the north, William Almy Wheelock owned a plot of land. Born in Providence, Rhode Island in 1825, his family had relocated to New York City in 1837 when he was still a boy. The prodigious Wheelock was graduated from New York University at the age of 18; supporting himself during his studies by teaching in the University’s grammar school. The 18-year old went into the wholesale dry goods business as a partner in Bliss, Wheelock & Kelly. In 1850 he married Harriet Efner. The Wheelocks had two children, William Efner and Harriet Wheelock. Following Audubon’s death, Wheelock helped Lucy (called Minnie by most) with her finances. In the early 1860s both Minnie’s sons died and staying in Audubon Park may have become emotionally too difficult for her. She moved not far away, just south of Trinity Cemetery. By now Wheelock had amassed a sizeable fortune and in 1862, at the age of just 37, he retired. The Audubon Park neighborhood was filling with mansions surrounded by park-like grounds and on November 1 that same year, Lucy Audubon conveyed a portion of her land to Wheelock for $13,000—around $300,000 today. The Wheelocks replaced the Hall mansion with a more modern, fashionable dwelling. 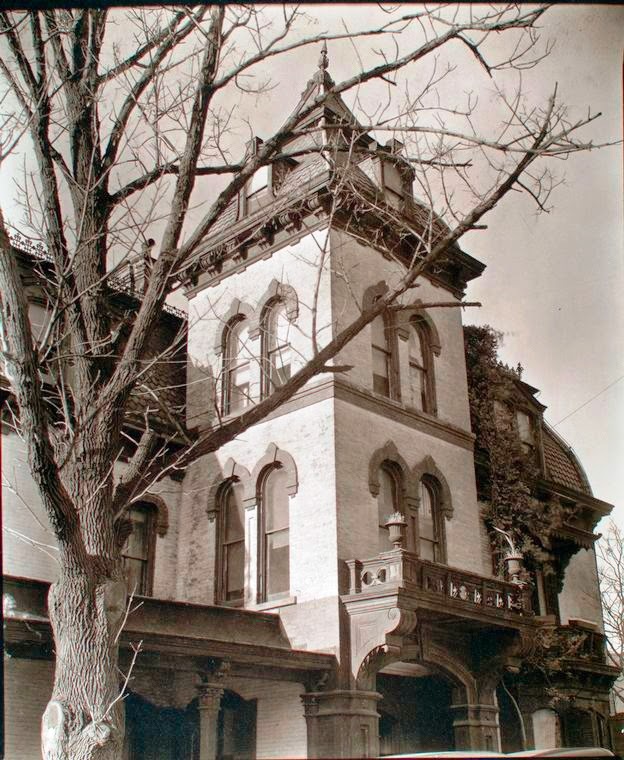 The resulting brick-and brownstone residence had every bell and whistle a Victorian villa could ask for. Multiple porches provided shade and caught the river breezes, and there were oriel windows, balconies, lacy iron cresting on the roof, and a tower. But the visual cherry on top of the Gothic Eclectic style house was the wonderfully graceful ogee mansard that bowed and curved upward. The entrance to the Wheelock mansion sat just back from the carriage drive; allowing for sumptuous gardens to the rear. A surviving photograph from the turn of the century reveals Italian gardens with statuary and cast iron urns overflowing with vines and flowers. Retired, wealthy and with a completed mansion; Wheelock found himself bored. “But Mr. Wheelock was a man of affairs, and he could not stay idle long,” said The New York Times decades later. Two years after starting construction on his home he became Director in the Central National Bank. Two years after that, in June 1866, he became its president. But “recreation” was a relative term to Wheelock. That year he returned to his alma mater, first sitting on the university’s Council and eventually becoming its President. For 15 years he served as New York University’s Treasurer. As the city reached, then engulfed the neighborhood, the mansions of Audubon Park remained. All around, beginning in the 1870s, apartment and commercial buildings arose; but the fine homes of the Wheelocks and their neighbors held on. 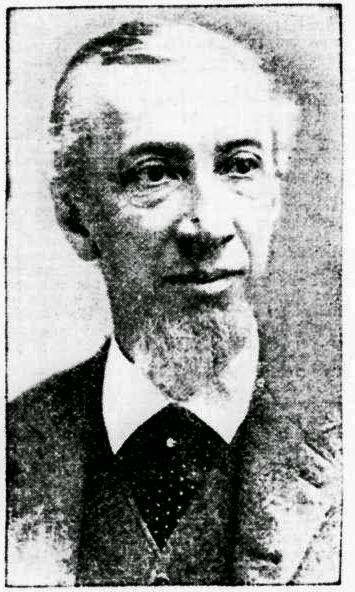 On Thursday morning of July 6, 1905, the 81-year old William Almy Wheelock died in his summer home in Easthampton, Long Island. Briefly Joseph Albert Wheelock lived in the house. The editor of the St. Paul Pioneer Press listed his address as “foot of West 158th Street.” The journalist died in 1908. 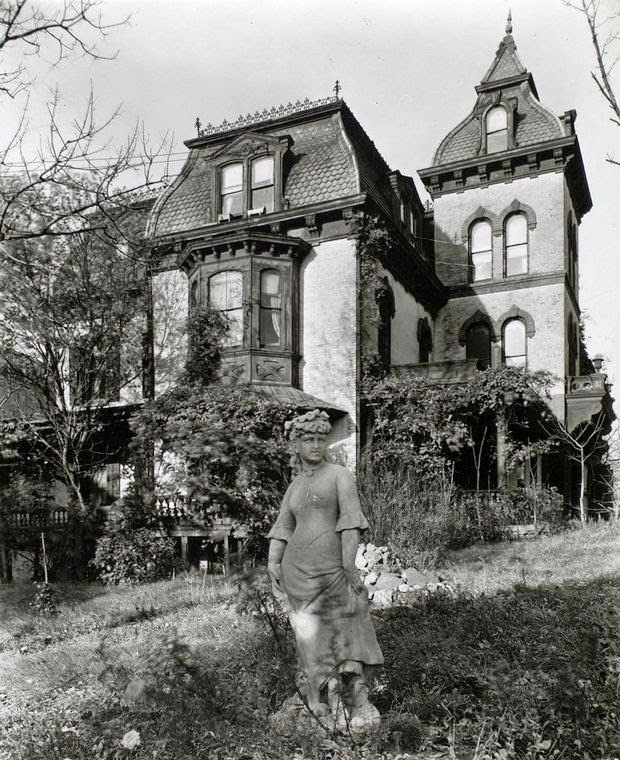 By the time of the Great Depression the Harlem neighborhood around the Wheelock mansion had drastically changed. Where John James Audubon, who eschewed cities, had created a pastoral enclave of country homes; now rowhouses lined the streets like blockades. On November 10, 1937 esteemed photographer Berenice Abbott, working for the Federal Art Project, was photographing the Riverside Drive Viaduct. She paused to capture the Wheelock mansion. 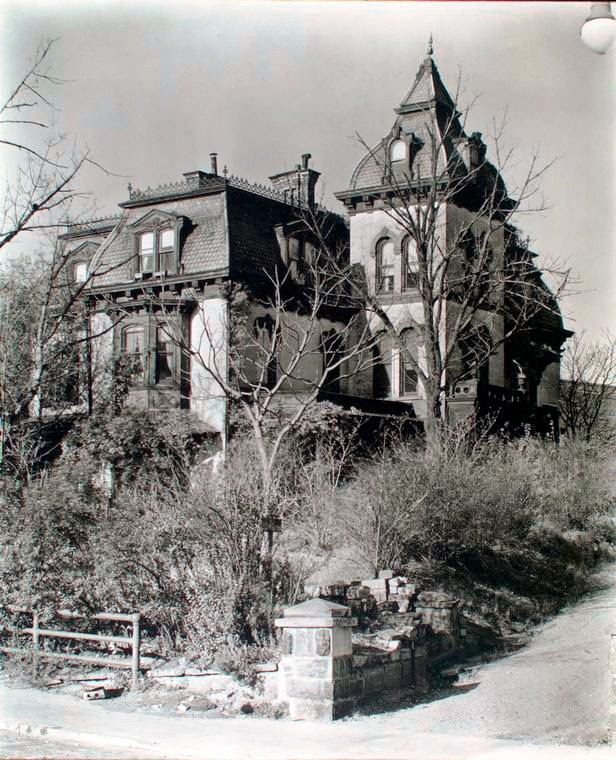 Abbot’s photographs show an overgrown garden and a once-gracious home; now fodder for Addams Family inspiration and children's Halloween terrors. But still maintained, the mansion retained its faded elegance and Abbot’s photographs exude a sense of poignant nostalgia. Berenice Abbot captured the images just in time. Four years later the City purchased the property from the Wheelock Estate and demolished the mansion to build a low-income housing project.